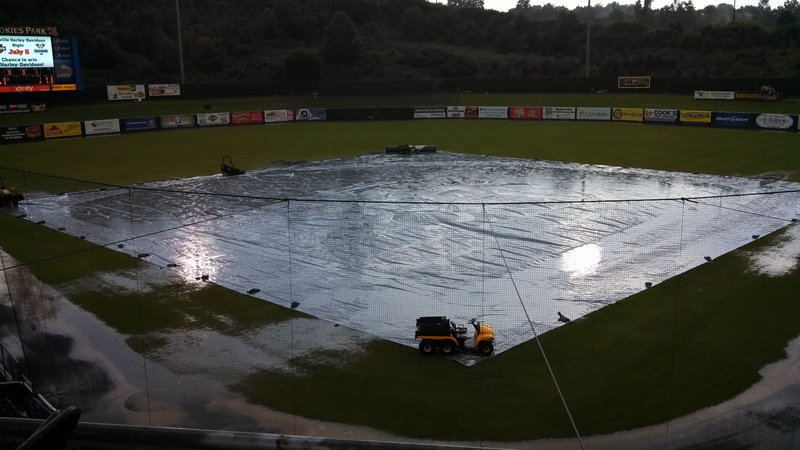 Smokies Park was pummeled by rain over the last two days. TODAY’S GAME: the Generals open a homestand tonight with game #1 of a 5-game series against the Birmingham Barons. This is the 3rd series between the North Division rivals with the season series tied 5-5… 24-year-old Roenis Elias makes his 15th start for the Generals and 3rd of the season vs. Birmingham. This is his 49th overall start in his pro career. Elias is 3-2 with a 2.01 ERA on the road as opposed to 0-5 with a 4.20 ERA at home. GENERALS RECAP: The Generals and Smokies made it to the bottom of the 2nd inning Friday when rain hit Smokies Park in game one of the doubleheader. After a 2 hour rain delay the game was suspended with Tennessee leading 2-1 with one on and one out in the bottom of the second inning. Game two of the doubleheader was postponed. NEWS & NOTES: 30 of first 74 games have been 1-run games (10-20) which is the 2nd in all of minors…42 of 74 games have been decided by 2-or-fewer runs (13-29) and 7 have been extra-inning games (2-5)…In games decided by 3+ runs the Generals are 19-13. • ALUMNI REPORT: 2012 General LHP Danny Hultzen made his first start since April 19th last night for Tacoma vs. Las Vegas and tossed 6 shutout innings, allowing just 2 hits walking 1 and striking out 6. He threw 78 pitches. • YOUNG GUN: 21-year-old OF Julio Morban is the 5th youngest player in the Southern League. Morban currently is 2nd in the league with a .311 batting average is 4th in the league with a .495 slugging percentage. • MR. JONES…MR. JONES: OF James Jones has hit safely in 6 of his last 7 games, batting .286 (8×28) with 3 runs scored, 1 double, 2 home runs and 7 RBI. • EXTRA MORLA: Since being promoted to Jackson, 5 of Ramon Morla’s 6 hits have gone for extra-bases (2-2B, 3 HR). Overall he is batting .231 (6×26) with 4 runs scored, 2 doubles, 3 home runs and 8 RBI. • NEW FRESH PRINCE OF TACOMA: RH Taijuan Walker was promoted to Tacoma Friday and tossed 6 shutout innings Tuesday against Fresno in his Tacoma debut. In Walker’s final Jackson start, he struck out a career-high 12 last Thursday against Mobile. In his last 5 Jackson starts, struck out 39 and walked 5 in 32 2/3 innings, all while allowing opponents to hit just .191 (21-for-110). Hemade 39 starts for the Generals in 2 seasons complete with rates of 9.1 strikeouts and 3.4 walks per nine innings.